Using NIR (near infrared) Illumination and real-time image processing, we can make the veins more visible! These 20 projects are the semifinalists of the Assistive Technologies category of the 2017 Hackaday Prize. This project was created on 07/29/2017 and last updated 2 months ago. Medication that can’t be ingested through the gastrointestinal tract has to be injected intravenous – usually by a doctor but in chronic diseases it can also be carried out by yourself. Our aim was to develop an assistive technology for venous puncture for diagnostic purposes or for medical drug administration. Easy reproduction and low costs are important criteria for development. We built three prototypes which are working on the Raspberry Pi: Two of them differ regarding to the camera system used - one works with the PiCAM, the other with a modified webcam. The third one is a mobile version which is more compact and can use a smartphone or a computer as a display. Besides we compared our project to a professional vein detection system that costs about 4.000€ while ours would cost about 100€ - and the quality is the same. A chronic disease which requires frequent venous puncture is hemophilia. In the blood clotting chain, one or more essential enzymes are missing or build in a non-working way due to DNA corruption. This can cause severe bleeding into joints, muscles or inner organs and is potentially live threatening if the rest activity of the clotting factors is below a few percent. Today, most of the clotting factors can be artificially synthesized through biomedical engineering (cell cultures with a changed DNA produce them), but they still have to be administered externally – injected into the blood stream by venous puncture. Venous blood vessels used for medication are not always easy to recognize and if the needle is not secure in the vein, it must be punctured again at another point. Here our project comes into play: Using NIR (near infrared) Illumination and real-time image processing, we can make the veins more visible, allowing easier Access, less pain and more confidence for medical personell and patients. The veins are illuminated with IR light (950nm) and the back scattering is captured by the Raspberry Camera (the one without the IR-filter). You can use old analogue film tape as a filter to block visible light and let only pass IR- light. The camera picture is processed in several stages to get an improved distribution of light and dark parts of the image (multistage local adaptive histogram equalization). The reason to use near IR illumination lies in the optical properties of human skin and in the absorbance spectrum of Hämoglobin. The Raspberry PiCam can be used without further modifications. However, this camera offers only a fixed focus and cannot adjust to the image scene automatically (only brightness etc.). Another possibility is the modification of a webcam – removing the IR blocking filter. It is a bit tricky, but we have been able to use such a camera from my previous research project (“eye controlled wheelchair”). At the beginning of the program, the graphical user interface is constructed, in which, in addition to the converted video stream, sliders are shown for parameters like Brightness and filter adjustments. In a continuous loop, single images are read by the camera and the filters are applied. BTW all needed files (3d-code, schematics, code) are available on Github! As you can see, the array contains very, very small values (e^-6 to -23 e.g.) – and if values between 0 and 1 are transformed to the range from 0 to 255, these very very small numbers – just stay zero. Just out of curiosity, we tried what would happen if you just multiply this array with a huge factor, e.g. 2500000 – and we got our filtered results ! This image shows the original camera NIR image (upper left) and the first and second stage image enhancement by overall and region specific level adjustment (CLAHE filter). The last (lower right) picture shows the frangi filter result, and you can see that it’s just the major veins being left. So, do make a long story short: Yes, the frangi filter is a major contribution to vein detection and could make future versions of our Veinfinder even more powerful. Thanks to Dr. Halimeh from the Coagulation Centre in Duisburg, we were able to compare an earlier prototype with a professional medical vein detection system – and even at that stage, both delivered comparable results concerning the detection depth of veins. Researching how to further improve our Venenfinder, we came across a filter that is used for detecting and isolating vessel-like structures (branches of trees; blood vessels). It is used to isolate the filigree structures of retinal blood vessels by looking for continuous edges – the frangi filter. It is named after the Alejandro F. Frangi who developed this multi-stage filter together with collegues for vessel identification in 1998. Luckily there is a Python library for it  – and it is part of the scikit-image processing libraries, but you have to compile from the sources since the Frangi filter itself was introduced in version 0.13x up and 0.12x is the latest you can get via apt-get install. As explained in the previous post, we simply could not get this filter to install/compile in the virtual environments, so we went for a clean install of Raspian Stretch and OpenCV 3.3 without any virtual environments to get the desired image processing libraries. We always got a black image containing the frangi filter results, no matter what. We started from scratch following mostly Adrian’s superb tutorial. Following the advise in the forum, we changed the swapsize accordingly and rebooted afterwards – just after we did the reboot to expands root-FS. Then we followed Adrians’s blog, but again did not install the virtual environments, because in all the other tests we could not get Python 3 to work with Sci-Image-Filters and CV2. We verified that the latest Version of Venenfinder will work with this Version of OpenCV. In the latest posts, I described how we installed the buzzer and the switch and here is how we put it all together on the Raspberry! Here we had to deal with a few issues – we wanted to “lock down” the Venenfinder a bit in term of casing, so people who just want to use it for medical reasons won’t have to worry about electronics, wires etc. Of course it is still open under the CC license! But since we did not plan to have easy maintenance access, we had to take our device a bit apart, unfortunately. The (active) buzzer fits in the casing quite well, and we even found a little space for the on/off push button. In order to save time we opted against 3d-printing the lid again with a precise opening for the switch. We just drilled a hole instead (a real “life-hack” ). Since we always used to turn the Raspberry Pi off just by pulling the plug, which isn&apos;t good for the computer and the SD-card system, we applied a switch to the mobile version in the previous log that turns the Raspberry Pi on - and we need a way to turn it off. We decided to use the same switch to turn the Raspberry Pi on as to shut it down safely to keep things simple. Debouncing is not really necessary, so the 500ms is uncritical. We don&apos;t count, just any press on the button will shut the Raspberry down. We tried it with a spare Raspberry on a breadboard and since it worked straight away, we now include buzzer and on/off key into our prototype as a next step. In addition to the starting switch, we applied an active buzzer that beeps three times when the Raspberry Pi turned on. This is important to know when the Raspi has fully booted because you can&apos;t see when everything has loaded, since there is no display. The buzzer is connected to the GPIO pin 19 and to GND. To make life easier for us we chose to use an active buzzer that doesn&apos;t need to be switched on and off to generate a sound, it simply needs to be connected to power for the time you would like to hear the buzz. Again, this was tested on a different Raspberry on a breadboard before we went to install it on the "ready prototype". We only have this one mobile prototype and we have promised to send it to a patient in need asap - so we need to make sure everything is fine. buzzerpin = 19                     # attach buzzer between pin19 and GND; check polarity! While using the Venenfinder, we realized, there are some ordinary difficulties with our prototype, so we decided to make some updates! We didn&apos;t want to test these updates on our "ready prototype" - just in case something gets wrong - so we at first tested these modifications with another Raspberry. If the Raspberry is powered via the Micro-USB-Cable it starts immediately as soon as power is applied. If you properly shut the computer down you normally have to repower (unplug, replug) either the Micro-USB-Cable or the power supply to boot up again. But there is an easy option to it: A switch causing the Raspberry to start - it just need to be connected to GPIO 3 (or 5 depending on the scheme used). Our next plan is to use the same switch to shut the Raspberry Pi down safely without just pulling the plug. And, since it is running headless, you would have to ssh into it to tell it to "sudo shutdown -h" - not a working solution for people who just want to use the device as effortless as possible. Oh, and we also want to add a buzzer to get a signal when the Raspberry is fully booted! Most people have their smartphone almost always near by, so that in the ideal case for the "evaluation unit with screen" no further costs arise, since the smartphone assumes this. Older smartphones or keyboard handhelds often have a smaller IR blocking filter (different from devices and manufacturers, the iPhone, for example, has a very strong IR blocking filter), so they are not capable of performing the optimization algorithms, but in the video preview Could already show veins more clearly by mere IR irradiation. In this case, a very cost-effective solution would be possible (only IR LEDs are required). Another possibility to develop a mobile variant is to connect the modified webcam to a smartphone using a USB-on-the-go (UTG) adapter. Not all smartphones support this - but it would be a way to bypass the built-in camera. Then you would have a corresponding IR-sensitive camera with built-in lighting and the possibility to additionally optimize the video mobile by software. We chose the second version. 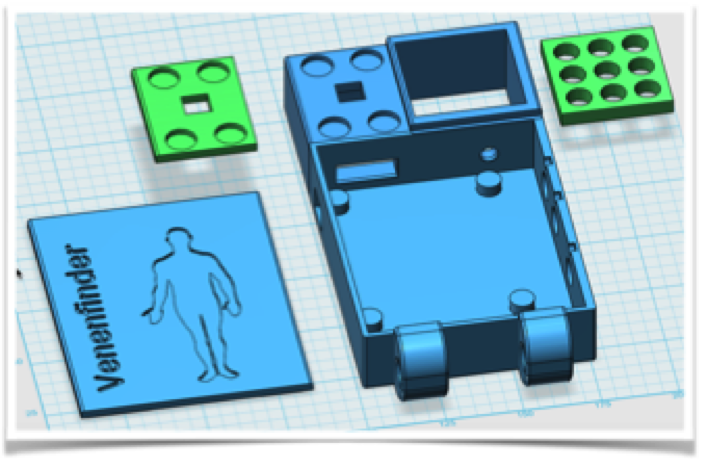 For the hardware you simply need to print the stl-files according to your 3D-Printer’s software. The case is designed to fit the Raspberry Pi3 with the three encoders attached, but you can adjust it to you needs. The Encoders attach to GND and to the GPIOS 20,21 / 18, 23 and 24,25. The IR-LEDs used have a peak at 940 or 950 nm and require a 12 Ohm Resistor, it you connect three of the LEDs in series. Connect 3 series of the LEDs with a resistor parallel and you have an array of 3x3 LEDs, which will fit into the casing designed for the reflectors. The veins are illuminated with IR light (950nm) and the back scattering is captured by the Raspberry Camera (the one without the IR-filter). You can use old analogue film tape as a filter to block visible light and let only pass IR- light. The camera picture is processed in several stages to get an improved distribution of light and dark parts of the image (histogram equalization). The reason to use near IR illumination lies in the optical properties of human skin and in the absorbance spectrum of hemoglobin. And there is a tutorial that is linked here, where you can turn the Raspberry into a hotspot step by step. As an alternative to the ready-to-use Pi-Camera, we (re)used a webcam that already had been modified in a previous research project (Eye controlled wheelchair, http://hackaday.io/project/5955). We had removed the infrared filter and replaced the two white LEDs with infrared LEDs. The following figure shows the webcam without housing, the converter chip without optics and the completely reconstructed camera with the two IR-LEDs (violet dots). Figure 12: modified webcam from the project "Eye controls wheelchair"
A USB webcam offers several advantages: It can be connected to other computers than a Raspberry Pi or even smartphones (see “Whats next”) and is more flexible concerning the connection cable. Furthermore, this camera has a built-in autofocus and already supports illumination sufficient enough the range needed here (well, you have to exchange 2 white SMD LEDs for IR ones). The disadvantage is that rebuilding this device will be more complicated since soldering SMD components is required along with removing the IR blocking filter (cut it off using a sharp blade). Additionally using a USB camera with the Raspberry Pi, you may loose a bit speed/performance because the CPU has to do the transfer over the USB2, while the Raspberry camera can be handled by the graphics processor with no additional load to the CPU. Figure 13: Construction of the camera for the modified webcam The code is a bit different, since the camera does auto contrast and auto brightness along with autofocus. This second prototype can be build from scratch and you can of course modify it to use the Raspberry Pi Camera as well. For the moment the Raspberry is still without an enclosure attached to the back of the monitor for easy access – but still not comfortable enough for the intended users. Our vein-detection system can not only be used for intravenous medication but also for obtaining blood samples. Both the image acquisition and the calculation of image optimizations are carried out on the fly, meaning patient and doctor see directly where the vein to be punctured can be found. Therefore we kindly asked two haemophilia specialists to have a look at our Vein detector and give us a feedback. In particular, we discussed our two prototypes with Dr. Klamroth, chief physician of the Center for Vascular Medicine at the Vivantes Clinic in Berlin. He confirmed that only veins near the surface are found with optical devices. Veins below 1mm depth should be localized by ultrasound. Furthermore, finding veins by cooling the skin and using thermography imaging is counterproductive, because veins contract if the skin is cold and are therefore even more difficult to puncture… Dr. Klamroth advised us to extend the results so far and, if necessary, to look for ways to additionally mark the veins in the video displayed as an orientational aid for the user. A few weeks later, we were able to present and discuss our prototypes in the Competence Care Centre for Haemophilia in Duisburg (www.gzrr.de). Dr. Halimeh and Dr. Kappert tested both prototypes in comparism with their professional medical system for Vein illumination. The professional device uses IR light as well, but then projects the image back to the skin using red a laser. Of course the professional system is much easier to use, no bootup time and adjustments needed, but we can compete in terms of image quality! Great one ! One can you please share the circuit diagram ? It is not clear in the files. I was excited to see your work. Picc lines are no longer an option for me due to vascular failure years ago...recently I discovered how visable veins are using diferent light spectrums, (in veterinary surgery), this will be such a benefit to the medical community as well as the patient. I learned of this project shortly after leaving the hospital. I was there for several weeks and was going through IVs every 2-4 days and getting blood drawn daily. On top of all that I was a "hard stick." It wasn&apos;t uncommon to take multiple nurses (and sometimes multiple hours) to set a new IV, or require someone else to come back and draw my blood after the first failed. To say the least, I find this project interesting. I would love to see the files (specifically the software) necessary to recreate this for my own use. Congratulations on the win! Awesome project. Nice team and such a good project! A low cost smart camera using cognitive programming to see more than what we can perceive. Inspired by RoboCop ! A camera and Computer Vision to capture wildlife and pipe the data feed to a variety of endpoints including a dashboard and databases. You are about to report the project "Assistance System for Vein Detection", please tell us the reason.